If you're into the challenge and reward of trapping, check out this DukeTM Trap for an affordable, effective setup. For mink and muskrat. Has 4" jaw spread. Duke No. 1 Long Spring Trap is rated 4.5 out of 5 by 6. Rated 5 out of 5 by elmo from Duke No. 1 trap Great trap, works well at the best price I found. Rated 4 out of 5 by Jim C from The price was fair. The product works GREAT for small critters. already had great success! 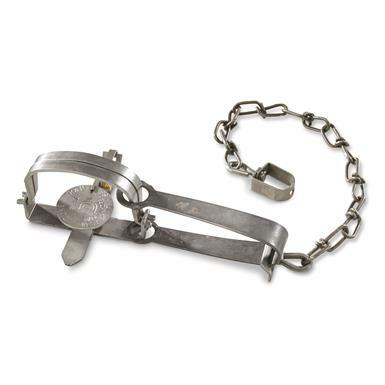 Rated 3 out of 5 by Andy from duke trap # 1 long spring good price, but when setting one of the traps it came apart had to take it home on my work bench and put a clamp on the spring until I could put it back together. The jaws came off. Rated 5 out of 5 by JIM from As advertised. Will buy more. Rated 5 out of 5 by JERRY from Not only for trapping but can be used to decorate the walls of a cabin. 35.25" long, weighs 24.9 lbs. World's LARGEST real, working traps!